It’s Not You. It’s The Wireless. 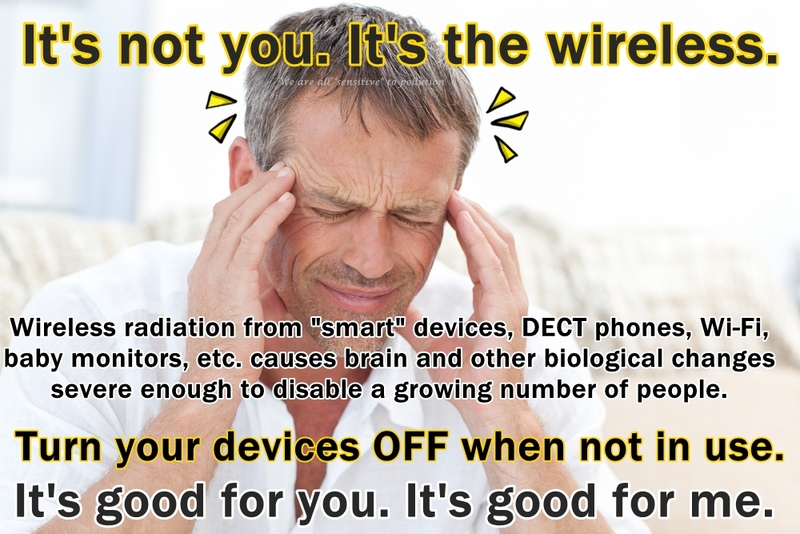 Just like toxic chemicals aren’t adequately regulated to protect public health, neither are the levels of microwave radiation that we are all subjected to on a 24/7 basis, whether or not we want to be. And none of us have been asked if we consent to any this. They (we?) are still raising awareness about smoking, breast cancer, asbestos, lead, and many other things they/we already know enough about to take action and stop the causes of adverse health effects from multiplying. Sadly, these days the toxic economy is more important than public health. So, we have to learn how to protect ourselves as best we can while working to change the system to one that values health and life more than money. 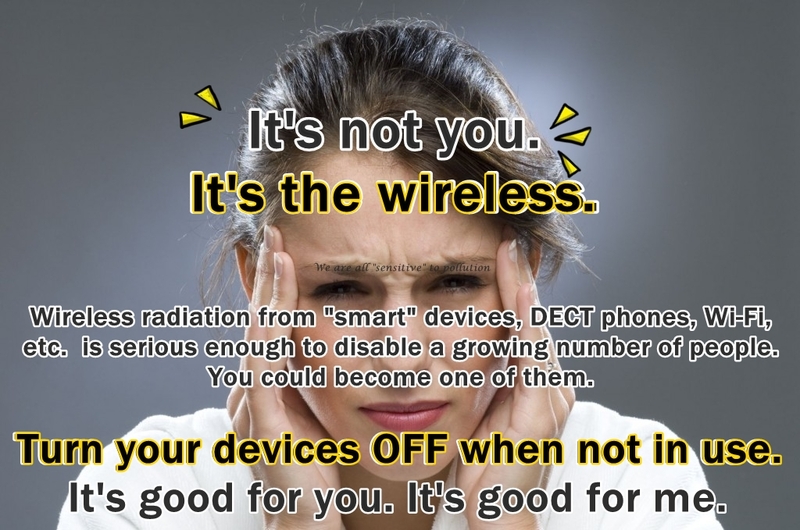 Here then are some photo memes and resources to raise awareness about the dangers of wireless (seeing as raising awareness is all we can do some days). 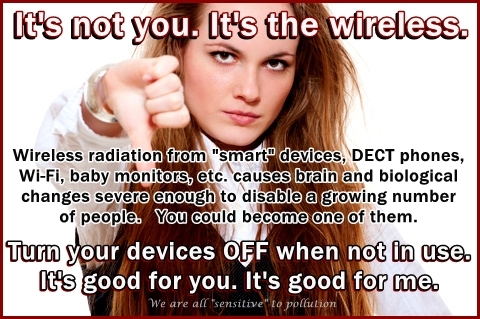 “Do you believe that electromagnetic hypersensitivity is real? Absolutely! My wife is chemically sensitive and has been to hospital a couple of times from exposure to pesticides. Over the last year or so, she’s been developing electrosensitivity. Demand legislative changes that protect our health and well-being, not industry’s ability to profit while harming us. regulators need to look at ALL the evidence, not just industry provided evidence. Sacrificing health for profits makes no sense. And it’s wrong. Just plain wrong. Let them develop safer technology. 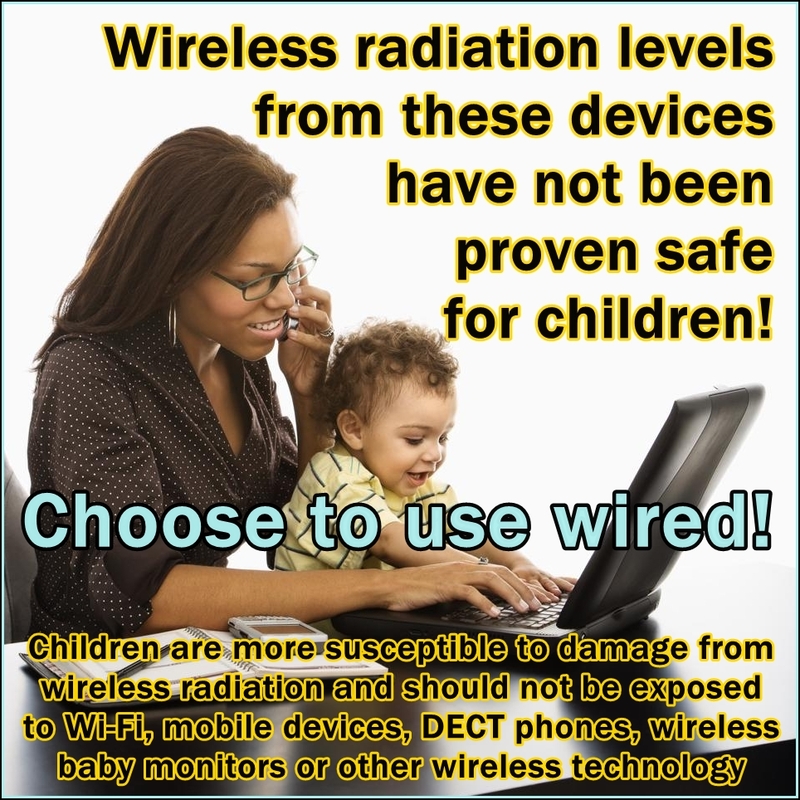 This entry was posted in Accessibility, Brain, Child Health, Disability, Precaution, Wireless and tagged baby monitors, children, DECT, EHS, environmental sensitivities, health effects, It's not personal, It's not you, it's the wireless, microwave radiation, wi-fi, wireless dangers. Bookmark the permalink. I have MCS, CFS and Neurally mediated Hypotenstion. We have the wi-fi turned off at night, but annoyingly this only gives my boyfriend a better night’s sleep (he sleeps fine as it is) and doesn’t help me at all. I have dreams of renovating a house with a ‘safe’ bedroom (a farraday cage with a queen bed! It’s really hard to get away from… but it does help to turn it all off when we’re not using it, even if we don’t feel a difference, as the effects are cumulative according to the experts. And distance helps too. Anything we can do to minimize exposures is helpful (although for some, not enough).